SimulScan is free for many scanning scenarios, including when used with Zebra's DataWedge service and its default Templates, from a custom app to scan only barcodes, and/or for certain types of optical character recognition (OCR). A per-device license is required for advanced SimulScan features such as detection and capture of checkmarks and for scanning highly complex targets. A complete breakdown is below and shown in the Licensing Matrix. A SimulScan License is required for each device that will access SimulScan advanced features. A Device-specific License is assigned based on a product name and serial number, and will fail if transferred to a different device. A Deployment License works on all devices in a deployment, and is intended for remote- or mass-deployment scenarios. The Deployment License Key is user-generated on the licensing website. Demo licenses are available for evaluation and early integration. A license is not required to use the SimulScan Demo App. A Factory Reset clears the license from the device; license redeployment is required. SimulScan Licenses are purchased directly from Zebra Technologies or through resellers of Zebra products. The section below explains the process for licensing devices for SimulScan use. After a licensing agreement is arranged with Zebra or a Zebra reseller, an email containing user credentials will be sent to the licensing company's representative for access to the Zebra Enterprise Software Licensing system. Options for SimulScan licensing might vary from the image shown. Once the desired license(s) are purchased, they must be assigned to device(s) before being deployed commercially. Licenses can be deployed manually or remotely using Zebra StageNow or a compatible mobile device management (MDM) system. 1. Enter the device model and serial number (as shown) and other required information. Press Submit when done. Individual licenses must be applied manually at the device. Deployment licenses can be deployed remotely en mass. 2. Download the SDC_License.xml file from the licensing server to a local PC: Licenses are tied to the device model and serial number and will fail if transferred to a different device. 3. Push the License file to any location on the device. In the SimulScan Demo app, select Menu -> License and tap the "Install" button. In the Settings panel, select About Phone -> Legal Information -> Symbol Licenses -> Menu -> Install license. 5. Navigate to the License file pushed to the device in Step 3. 6. Tap on the License file. On success, a confirmation message appears. Manual License deployment is complete. Generate a Deployment Key on the licensing website. Launch the StageNow wizard and select "SimulScan mass-deployment." Input the Deployment Key when prompted. Deploy the Key to devices. 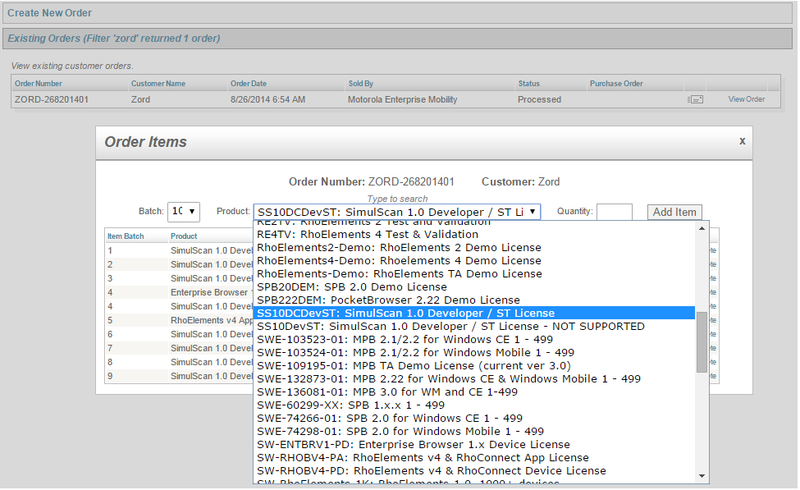 Once deployed to the device, SimulScan Licenses are installed automatically. For details, please refer to StageNow documentation. Visit the License Request form. Follow instructions found on form. A reply will be sent with access credentials for Zebra's Software Licensing Portal, generally on the next business day. Follow directions to assign the license.